As I was sending out invitations for our daughter’s birthday party, the question of gifts crossed my mind. A long time ago I read in one of Miss Manners’ advice columns that it was bad manners to expect a gift. Therefore, it followed that it was was not polite to offer any instructions about gifts to give or not give. Although Miss Manners made a slight concession for children’s birthday parties, I agreed with her logic and simply kept gifts out of our vocabulary when inviting friends for parties. Her concession, as I recall, was that one could, for example, decorate the invitation with images of say, books or trains, as a hint to parents wondering what to bring as a gift. From the perspective of a parent of a child attending a birthday party, I can appreciate that it is nice to get such a hint. But surely we can do better than that? Can we not take the time to give a gift from the heart? Also, let’s face it. It’s 2016. We know the Story of Stuff. My daughter asked me if I wrote “no gifts” when inviting people. “Why not?” she asked, disappointed. I needed a better answer than, “it is not polite to say anything about gifts.” I needed to do something proactively. If we say nothing about gifts and people are left to fall back on the social convention of having something shiny to hand over to the birthday child, then while we haven’t violated any etiquette, we are still contributing to the problem. What we need to do is to nurture a culture of celebration that is not centered on giving things, especially not costly things. There has got to be a way to create an alternative to conspicuous consumption, politely. Then I realized that it takes a village, and my tribe was already at work changing the culture of birthday gifts. I thought back over the kinds of gifts Khiyali has typically received for her birthday. When she was very young people would give her art and craft supplies, books, sometimes games, and I tended to follow suit when she went to birthday parties. When she turned 6, during the opening-of-presents, one of her friends pulled out a few sheets of construction paper on which she had illustrated a story, and read it aloud. The oohs and aahs from all the kids and parents revealed that this was the most admired gift of all. In our neighborhood in Mumbai, birthday parties have evolved. Nowadays, kids typically invite their friends over the day before or even an hour before their parties. One reason for this is to keep the party focussed on fun and leave no time for people to run and buy gifts. At first some of them said “no gifts” but now this has become part of the culture. Over the years, whether in Mumbai or in Bel Air, we have seen more gifts of the home-made, heartfelt variety. One of her friends has given her amazing pop-up cards. Some bring drawings or flowers from their gardens. Another young girl gave her a packet of seeds that she collected from flowers that she grew in her backyard. 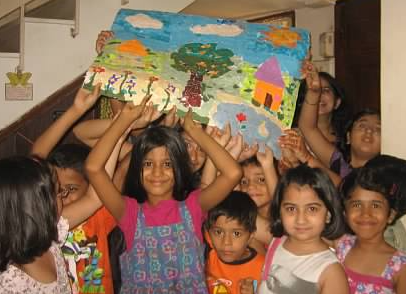 On her eighth birthday, Khiyali’s friends gave her a paper montage that they had all made together. Khiyali and her friends all worked together to make this paper montage. On her birthday, her friends gave it to her as a gift. This year, my sister got cardboard tubes from the fabric store, to be up-cycled as, well, cardboard tubes to whisper long-distance. One of her friends gave her some book recommendations. What a thoughtful gift! Handmade cards and gifts have become the norm. Children use cardboard tubes to talk to each other in amplified whispers. Cardboard tubes are also good for blowing bubbles in the fountain with. 2/3 got soggy on the end and were thrown away, but the third remains and is still used as a telephone. It can also be used for sending things (pencils, tomatoes, light, etc.) to people in jail, where “jail” is defined as a cardboard refrigerator box. Yes, they are really fun, aren’t they?